A number of Southern African Faith based partners working on gender and sexual and gender based violence were invited by 4 members of the Act Alliance (Christian Aid, Church of Sweden, Norwegian Church Aid and Brot Fuer die Welt) to reflect on our practice, and consider ways that collaboration might open opportunities for new ways of working and collaboration between North-South and South-South partners for improved impact of gender work in the region. Session 3 opened up conversations about key learnings from our practice, ideas for collaboration and suggestions for practical action steps. I thought to share some key insights that we might wish to draw on for our own WWSOSA process of coalition-building. Resource mobilisation is key (as if we didn’t know that! ), and it is vital to understand the changing aid sector. The power relations between the traditional Northern donor NGOs and the South are beginning to change, with the northern donors actually needing our wisdom and experience, as they are facing for the first time the sorts of things we have faced for years, such as funding shortages, social upheaval and increasing violence. Can we enter into more mutual relationships with northern funding NGOs, where we offer our experience and expertise gained from years of working in difficult circumstances, while northern partners offer more technical expertise and knowledge of the global aid sector. Coalition-building and joint fundraising efforts can avoid duplication of work, strengthen our technical expertise, and offer a more streamlined approach to funding contracts for the funders. Engagement with faith communities has to be complemented with engagement with traditional and cultural beliefs and practices – particularly because they collude in resisting gender transformation and enabling, condoning, or perpetrating SGBV. We may need to consider approaching possible technical members to offer technical support in this? Or simply opening some shared learning platforms? We talk about ‘involving survivors’ and taking seriously their voices, as if we are separate from them. It is true, of course, that our practice needs to find creative ways of listening to the experiences of those who are most vulnerable to SGBV amongst us. Would this enable us to all start from a much more inclusive and safe place if we started from acknowledging that we are all affected? There is a huge need for shared learning spaces in general, and perhaps for creating ‘communities of practice’ in the NGO world. WWSOSA thus offers something that people need. Recent events indicate that what we have been doing to date just has not had the impact we had hoped for. The shared reflection and learning approach would help in identifying innovative ways of working. We cannot solve SGBV without tackling patriarchy and exposing it in all its guises – including in Scripture and religion. How do partners go about challenging patriarchal society, practically? How do we know whether / how our diverse contributions help to dislodge patriarchy (or inadvertently reproduce it)? If we respond to symptoms only – what are the consequences? How we use language matters – it is the main means of transmitting oppressive norms, challenging them, or re-imagining new ones. Are we conscious of how women, women’s bodies are reflected in language choices? Even violence can be normalized by our language choices (note that we ‘fight’ against GBV, local government has created ‘war rooms’ as spaces where people and government officials are supposed to work together to solve key social problems). A key message is that there is NO social justice without gender justice. Many churches and NGOs have excellent social justice programmes, but are blind to gender injustice. We need to develop critical lens to call this bluff, as WWSOSA in our advocacy work. Policy Advocacy in SA has been very successful in shaping national policies. But monitoring implementation of policy is much harder – it requires a combination of data collected by people on the ground and those with expertise– review and also implementation – need collaboration and cooperation for this to be more than a series of public statements. This takes us back to the importance of being conscious of our blind spots and working with great care on the power dynamics between us. We need each other – those working on the ground, and those making higher-level contributions. A number of people gathered to participate in the #NotInMyName march against gender based violence at the University of Johannesburg’s Soweto Campus to Regina Mundi Church. There were more than 500 people who participated in the march. Various church leaders, organisations and Government departments were visible and making noise against Gender Based Violence. The marchers chanted, ‘Not in my name’, with many thrusting their clenched fists towards the sky. Men were on the forefront holding banners and standing up against the brutality against women in our communities. The Open Disclosure Foundation, Sonke Gender Justice, the Buhle bolwazi Foundation and partner civil society formations are calling on government, communities and individuals to join a march this Friday, May, 26. 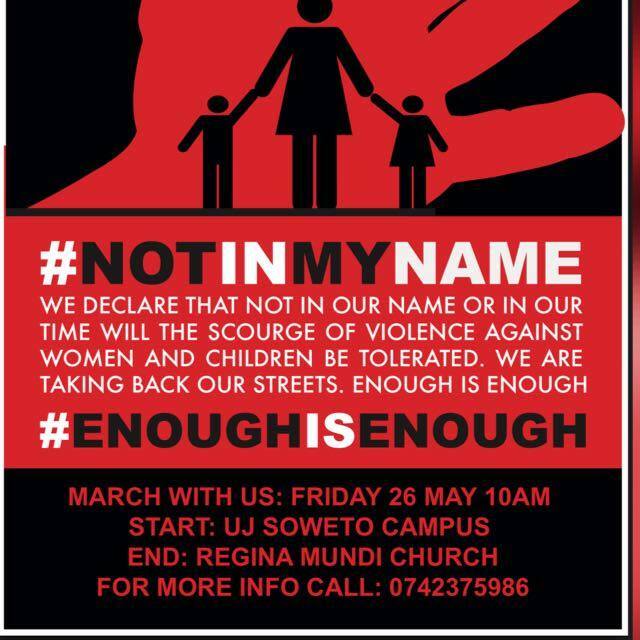 The march – #NotInMyName – will serve to register collective anger about how women and children are raped and killed in our society. Whilst noting the existence of government’s policies, strategies and programmes, the #NotInMyName campaign was borne to point to the fact that we live in a violent society, where women and children are brutalised daily. Join the march on Friday and stand up against gender based violence in your community. The march will leave from UJ Soweto Campus at 10:00, and will end at Regina Mundi Church.